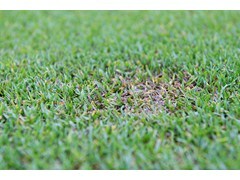 Turf plants have been under unprecedented levels of disease pressure this winter, compounded by wet and windy weather conditions that have too often prevented timely fungicide applications. 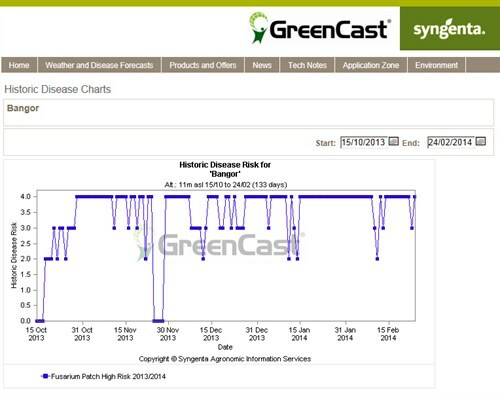 Disease records from the GreenCast website have shown a high risk of Microdochium (Fusarium) Patch infection on more than 85% of days, from October to the end of February. Syngenta Turf Technical Manager, Dr Simon Watson, highlighted the conditions had presented an incredible challenge for greenkeepers, to prevent infections spreading and to maintain turf quality. "High disease risk has been almost relentless, apart from a short-lived respite at the end of November," he recalled (Fig 1.). Fig 1.This winter has experienced almost continuous high risk for Microdochium Patch, exemplified by conditions in Bangor, Northern Ireland. "Fungicide programmes have been severely stretched, especially with growing conditions limiting the duration of contact only treatments," he reported. "Under these conditions, we have seen very good results from Instrata treatments to tackle disease outbreaks and to continue to protect uninfected plants." The experience of Bangor Golf Club Superintendent, Iain Harrison, has typified the risks and pressures faced by many this season. The intensively-played 18-hole Championship parkland course in County Down, Northern Ireland, has been subjected to the repeated onslaught of wind and rain right through the winter. 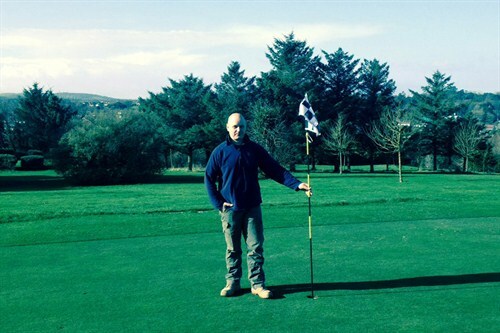 Iain Harrison: Instrata has proved absolutely invaluable for us this winter. "We aim to spray our annual meadow grass and bent greens preventatively, which has normally given me peace of mind through periods of high disease pressure. But no matter how good your skills as a turf manager, there are times when you will be prevented from spraying by adverse weather conditions. "When disease pressure is high, outbreaks can be inevitable. This winter, Instrata has proved absolutely invaluable for us," he reported. "At the very first sign of Fusarium outbreak, Instrata had stopped it dead; no other fungicide I know would do that. With the continual pressure for play, recovery time is important and I also get good rapid infill of treated areas." Although Mr Harrison typically uses around four fungicide applications a year, he believed Instrata remained a great tool to keep in the shed as a vital safeguard. "I use Instrata as part of an Integrated Turf Management programme, rotating actives as part of a resistance management approach," he said. 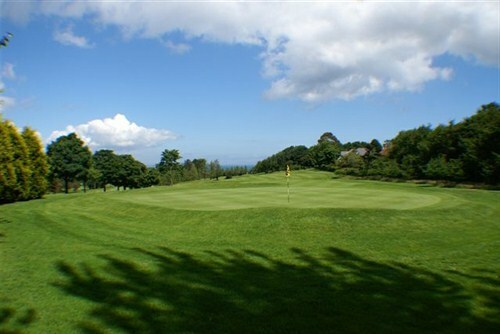 Bangor Golf Club is situated on the outskirts of Bangor, overlooking Belfast lough and the Antrim Hills. It is a Private Members Club, with upwards of 1000 playing and social members. The Club was founded in 1903 with a nine-hole golf course. The current 18-hole layout was designed by James Braid and, although it has been modified, it still retains many of its original features. The course has been redesigned in recent years to modern standards and presents the golfer with a challenge in scenic surroundings. 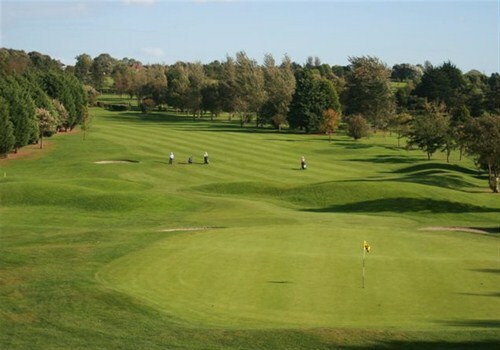 The course has attracted some major events, including the Ulster and Irish Professional Championships and Pro-Ams. The total length of the golf course is 6410 yards from the medal tees; Standard Scratch is 71 and, although not an especially difficult course, it is enough of a challenge to entertain good players without discouraging the less able. Supporting Iain Harrison's agronomy decisions at Bangor, Colman Warde of Everris added that Instrata had been used in precisely the right way, utilising the fast-acting multi-active treatment to supplement proactive preventative treatments and target disease outbreaks. "Only Instrata contains the activity necessary to cover all season conditions - including systemic uptake and movement for long lasting protection whilst turf is growing, contact activity to protect leaf during slow or zero growth and contact+ activity to target pathogens on the leaf and in the thatch," advised Mr Warde. "Each of the three carefully selected active ingredients work in a different way and on a different point of the disease pathogen's life-cycle. Using Instrata is an essential element of a disease control programme that will minimise the risk of pathogens developing resistance," he added.